In the modern-day world, we don’t really have much time to stop and stare. Everything is moving at a rapid pace, and, in order to be one with the flow, we sometimes have to sacrifice our free time and work more than ever before. That is exactly why it’s so important to use the remaining few holidays to the fullest. And while for some people, sitting in your own chair, drinking beer and watching a game on the TV is just what the doctor ordered, the rest of us crave for something different, something thrilling and exciting. I can say with certainty that the Kerandangan Beach will be just right if you’re looking for a getaway trip in a foreign country. 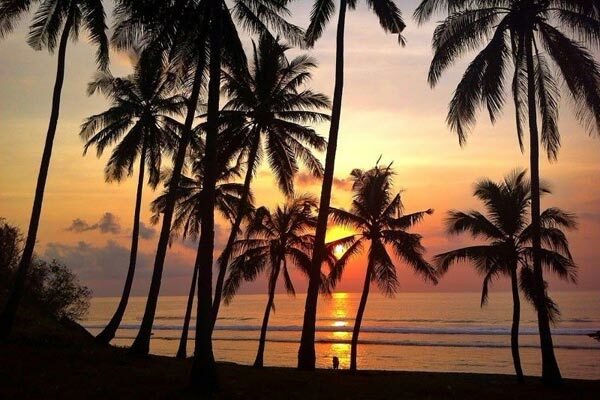 Located in Lombok, a tropical Indonesian island, this spot is peaceful, tranquil, and will welcome you with white sand, enchanting waves, and a charming atmosphere, perfect for leaving all of your troubles behind and focusing on what’s important at this exact moment – to relax and to have some fun. Now, if you’re a citizen of the concrete jungle, a change of scenery like that will already be quite satisfying. The lush forests, the birds in the air, the monkeys running around, and the unusual lifestyles of the locals will definitely leave a mark (in a good way). Nature in Lombok is wonderful, and the Kerandangan Beach is a tiny yet beautiful part of what makes it a popular destination. What Is The Kerandangan Beach All About? Take a good look at the map: as you can see, this piece of Heaven is located on the west side of the island, right above the world-famous Senggigi Beach. The atmosphere over there is lovely, and you’ll have fun even before you reach the destination. Thanks to Senggigi’s popularity, the government has turned that part of Lombok into a well-developed region with a solid infrastructure. And while beaches are all about that wild and free atmosphere and all the other treats of a tropical island, it’s the 21st century, and we all want quick access to ATMs, restaurants with Wi-Fi, and stuff like that. Yes, you’ll get it all on your way to the Kerandangan Beach. Now, West Lombok has no shortage of beaches – it’s practically covered in them. So, why should a regular tourist choose the one we’re reviewing today over the rest? Well, the biggest advantage of Kerandangan is that you won’t find any trash lying around there. The water, in turn, is crystal-clear, perfect for swimming and some quick dives. People love this place for the “secluded” atmosphere, and, even though you will see surfers every now and then, the waves are usually too calm for that water activity. Genearlly, visitors that get tired of the noise and parties in the more crowd-heavy spots come here to clear their heads and enjoy the silence. If you get lucky and visit this place during the offseason, the beach will be half-empty, if not totally deserted. For me, a man who loves to be in the middle of the crowd and enjoy the so-called “holiday vibes”, that’s rather a con than a pro. However, I know a lot of folks that will appreciate this fact about the Kerandangan Beach. The sunbeds are perfect for staying in the shadows and still enjoying the hot weather. The views from this beach are fantastic, fair and square. Even if you’re already used to the picturesque sceneries in Lombok, this spot will still find a way to impress you. Build your sand castle, swim in the water with your kids, and take pics when the sun sets. Without a doubt, selfies are one of the biggest reasons to visit Kerandangan. Because it’s not always crowded, you’ll have all the time (and space) in the world to make just the perfect photos. The sounds of the waves hitting the rocks and the reefs are very calming and will help you sleep better at night. Early in the morning, the fresh air from the ocean and the singing of the birds will set just the right mood for the rest of the day. Be careful, though, because the Kerandangan Beach might just make you fall in love with it! Sadly, most of us can’t stay on a tropical island and have to go back home. At the same time, if you’re a freelancer, this might just work for you. The biggest flow of tourists usually hits the beach by late afternoon – that’s when it starts to look like a million bucks. Usually, it’s families with children looking for that once-in-a-lifetime experience. With that said, the fans of solitude will have to wake up really early to be able to be one on one with the island. The camping enthusiasts and the fans of picnics really love this place. The palm trees are casting shadows that protect the visitors from the sun. The white sand feels awesome under your feet, and the water comes with just the right temperature for swimming. It’s got a green-blue color, and with the clear, open blue sky, it creates an amazing view. Please keep in mind that the Kerandangan Beach is divided into three parts (sections) because of the super long coastline. So, don’t be confused when the locals start talking about them. The wind cools down the otherwise hot climate and the coconut trees stretching along the shore add to the tropical vibes. The rocks on the far sides are very popular among the locals. From there, the place looks even more beautiful. I have to say that for some top-of-the-line selfies, you simply have to climb those rocks. The parking fee is very low, and you’re more than welcome to bring your own equipment, food, drinks, mats, and everything else in between. As mentioned in the beginning, this part of the island is well-developed. That means you won’t have a problem finding a place to stay and/or a place to have something to eat. The entire coastline is covered in luxurious hotels. Yes, they are quite expensive, but the views are marvelous. For the tourists on the budget, the Kerandangan Beach offers something different. There are some amazing options that will cost you a lot less but still provide decent views. You’ll have to move away from the beach to find them, but, again, they’re more than ok. Lombok has always been an island for everyone, meaning the price range is wider than in most other resorts. Same goes for the restaurants, cafes, warungs, and other eating spots. Some people prefer to bring their own food to the beach, but I say it’s only fitting to have a delicious meal at a nice café that’s 10-15 meters away from the coastline. Most businesses in Lombok are owned by families and they do everything in their power to please their clients. Everything looks lovely over there, that’s for sure. Take some time to walk up and down the shore to see everything the island has to offer. On a scooter/bike, you’ll get from this beach to Senggigi in about 4 minutes. Most of us land in the International Airport, so, let’s check out the available routes from there. The good news is – the shortest route is pretty straight and will take you through the better half of the western coastline, giving you a chance to admire nature from the back seat of a taxi. The bad news is – during the high season, traffic will be cramped up and you’ll end up wasting a lot more time than you thought. During the offseason, the ride will take you 1 hour and 15 minutes tops. However, when the tourist slow is strong, I’d highly recommend driving through the center of Mataram, the capital, to avoid the heavy traffic (turn to Jl. TGH. Abdul Hafidz when you get there). Renting is very cheap in Lombok and they’ve got renting spots all over the place. Public transportation isn’t really an option, as it’s slow, confusing (it’s hard to make sense of the routes and the schedule), and not fun at all. Taxi is expensive, but not for the western folks. Same goes for renting. From Mataram, the ride will take you 30-40 minutes and you’ll still be driving along the coast. Finally, if you’re in Kuta right now (another extremely popular tourist spot), get yourself ready for a 2-hour drive (1 hour and 30 minutes if you get lucky). For an intimate atmosphere, this beach is great. You can always stroll to the more crowded spots to have a different kind of fun. Never really knew about this beach, even though I've been to most of West Lombok. Thanks for this review! We had fun there. It was only half empty, but that didn't prevent us from having a good time. The Kerandangan Beach is 4 kilometers away from Senggigi; yet, the vibes are totally different. Honestly, I don't understand why Senggigi is so popular. It's trashy and noisy. Kerandangan, in turn, is just perfect!